After Daniel popped the question by the seaside in Enniscrone, Co. Sligo, the couple decided to tie the knot on St Patrick's Day, and set about planning a wedding with a gorgeous green theme. 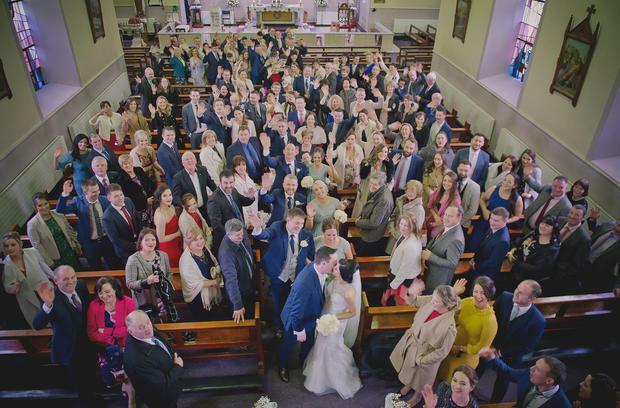 They exchanged vows in Church the Christ of King Knockmore, Co. Mayo, before their reception in the Ocean Sands Hotel - a venue set in the heart of Enniscrone. For Olivia, getting ready on the morning of the wedding was one of the big highlights of the day. As she prepared for the day ahead with her mother Bridie and bridesmaid Lisa, she decided to take a moment to read the card she had received from her husband-to-be - the audio of which videographer Johnny of Wedding Moments used as the base of this tear-jerking video capturing the couple's beautiful day (watch it with the sound on!). "I have looked forward to this day for a very long time," Daniel wrote. "You have always been my best friend, a shoulder to lean on, and my inspiration. You are without a doubt the greatest woman I have ever met." "I can't wait to see your beautiful face light up the church this morning." Real wedding moment 810 from Wedding Moments on Vimeo. 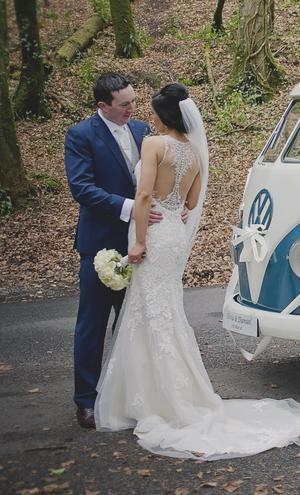 Olivia wore a wedding dress by Stella York, which she purchased from Dinagh Modes in Castlerea, Co. Roscommon. "The girls there are outstanding at what they do," says the bride. "They have a beautiful selection of dresses give their full attention for every appointment." On the day, Olivia's hair was styled by Hair by Jackie,who is based in Ballina and her make up was done by Andrea Murray. "Both girls were so nice to have on the morning of the wedding and really knew what worked for the bridal party," says the bride. Photos by Tanya of FoKiss Photography. Groom Daniel and his groomsmen all wore navy suits with check waistcoats from Eddie Murphy Menswear in Ballyhaunis while the bridesmaids wore sage green chiffon dresses with beaded detail from Pamela Scott. 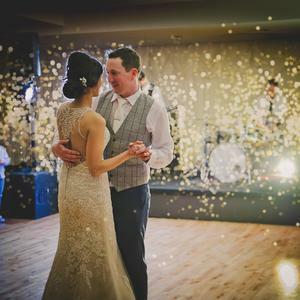 The couple chose the Ocean Sands Hotel as it was a venue close to their hearts, having been where many special family occasions were celebrated over the years. "The service and food has always been exceptional," says Olivia, "On meeting our wedding planner Olivia, we knew we had made the right choice as she was so obliging and could not do enough for us for our day. She made us, and the guests feel so welcome and ensured we were happy with our food choice and everything else for the day. Plus she was full of ideas!" "There really is so much to take in on the day," says Olivia, "I loved the excitement on the morning and getting into my wedding dress was so special... I just loved getting to the top of the alter and seeing Daniel's expression... Every moment is so precious and to make it even better we had our beautiful little girl with us to share our special day so that meant even more to us." Olivia and Daniel's day was documented by Wedding Moments, and on the day Olivia says they couldn't have been happier to have them there. "Our videographer Johnny engaged with all members of the bridal party and made us feel so relaxed," she says. "We can definitely say he did not disappoint in delivering the final product of our wedding DVD, we received a real wedding moment trailer which captured special emotions of our day and the other trailers we received were outstanding." "My piece of advice for other couples," says Olivia, "is to take the time for yourselves to enjoy your wedding day. The day really does go so fast so be sure to dance and laugh loads with your friends and family. Try not to get caught up on the little details, relax and enjoy your day. We would also highly recommend having a video and photographer as there is so much you will forget, and it is lovely to look back on and enjoy those special moments that were captured."